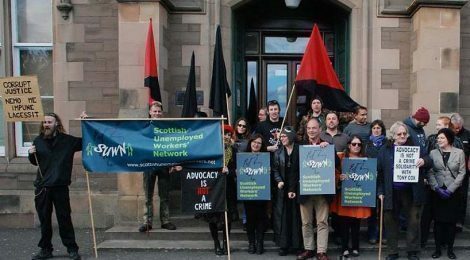 Please join Edinburgh Anarchist Federation and the Action Against Austerity Network and show your support for Tony Cox – arrested for trying to accompany a woman to her Work Capability Assessment and now on trial accused of ‘Threatening Behaviour’ for insisting on her right to have him accompany her. accompanied and in solidarity with Tony. a finger. Now they’re trying again. as FOI requests(and one apology for a High Heid Yin in the DWP) show. Jobcentre intimidation and bullying. Our message couldn’t be clearer. denies this, we will not step down”. Our advocacy will not stop. Because Advocacy is not a crime. bullied, intimidated or silenced. We will resist!